Day 1 – Departure for overnight flights to Milan. Day 2 – Benvenuto in Italia! A short transfer from the Malpensa airport will have you relaxing in the wine country. Do an easy warm-up ride or relax by the pool and meet your fellow travelers before our welcome dinner. Day 3 – Our cycling adventure starts after a morning transfer by private van. Wind up the beautiful Éores and Erbe Passes before descending to our lodging in the panoramic village of Antermoia. Edith, Enzo and “Mamma” will spoil us with Ladina hospitality and traditional mountain cuisine at our group dinner. Day 4 – We’ll be sorry to say good-bye to our hosts but we’ve got a big day ahead of us on our way to the Olympic village of Cortina – heart of the Dolomites. 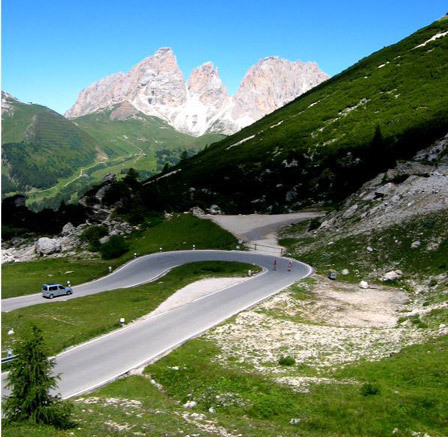 We’ll scale the Passo Furcia then cruise the scenic Val Pusteria before climbing past Lake Misurina and over Passo Tre Croci with a steep option to Tre Cime di Lavaredo. A final descent leads to our charming hotel just steps from Cortina’s lively downtown piazza. 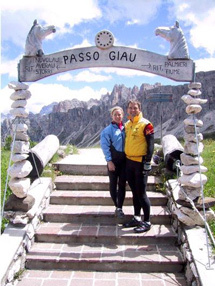 Day 5 – Fuel up at our buffet breakfast because today we climb the Passo Giau and the short but steep Colle Santa Lucia before tackling the twin passes of Falzarego and Valparola. The 20k descent to Corvara ends with a few last cruel switchbacks up to our luxury hotel featuring a panoramic view of Val Badia. Tyrolean wine and cuisine highlight tonight’s group dinner. 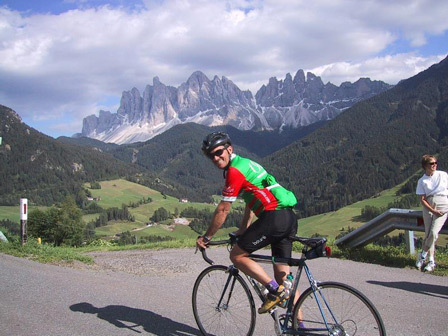 Day 6 – This could be the most scenic and challenging cycling loop there is. 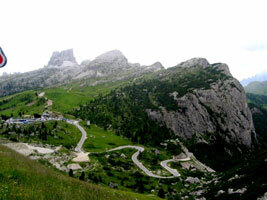 Start with Passo Campolongo then a twisty descent before the notorious Passo Fedaia (Marmolada). 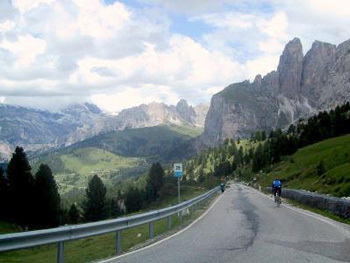 Continue the challenge and attack the Sella and Gardena passes before the thrilling descent into Corvara — but don’t forget the final “sting in the tail” climb to our hotel! Day 7 – Say “Arriverderci” to Corvara as we depart Alta Badia over the spectacular Passo Pordoi. 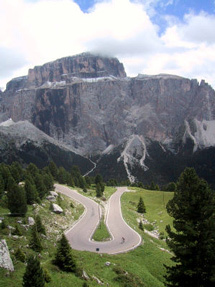 Next we’ll tackle the Passo Costalunga and a final climb to Monte San Pietro before a dramatic descent to our hotel. Another tasty group dinner awaits in the panoramic dining room. 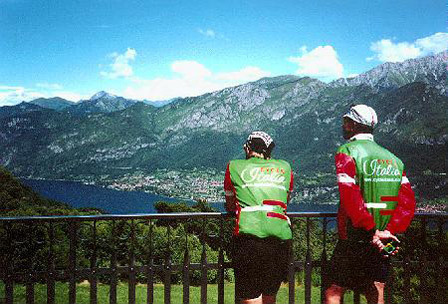 Day 8 – Today we cross the valley and scale the picturesque Mendola and Palade passes on the way to Val Venosta where a peaceful bike-route will carry you among fruit trees to our night’s hotel. A hearty group dinner of SudTirol cuisine will fuel us for tomorrow’s highlight climb. Day 9 – This is it — the big one! 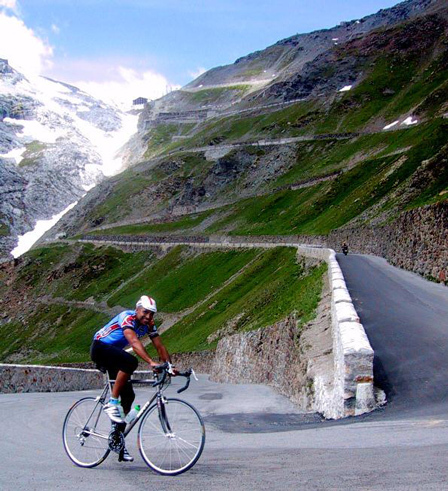 It’s time for the Passo Stelvio and the 20k spin from our hotel is a perfect warm-up. 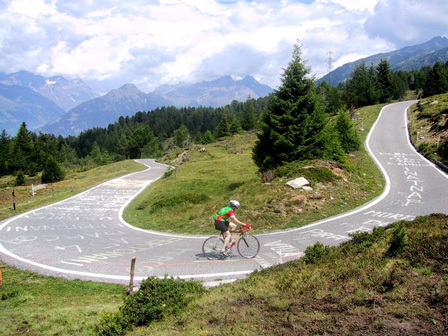 Tackle the 48 numbered switchbacks as you recall images of champions like Merckx, Gimondi and Coppi, imagining what it’s like to be cheered by screaming tifosi. Descend into Bormio and relax at our luxury hotel then share tales of the epic climb at a sumptuous dinner of Valtellina specialties. 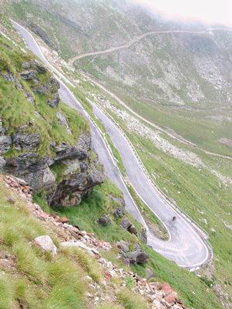 Day 10 – Today’s your chance to do one of the most challenging loops in all of cycling. Start with a descent from Bormio followed by Passo Mortirolo – 12 km of sheer pain with an average grade of 10.25% and pitches of 14%. Don’t admire the haunting Pantani Memorial for too long as we’re off to the epic Passo Gavia, scene of American Andy Hampsten’s frozen triumph in 1988. Return to Bormio for a relaxing afternoon and group dinner in the lively ski town. Day 11 – Today we head for Lake Como. After a brief transfer we’ll be spinning along the quiet eastern shore before a scenic ferry crossing from Varenna to Bellagio. 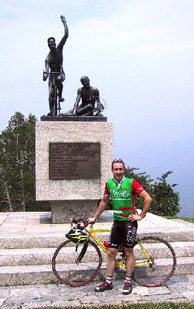 Then it’s up the historic climb to Madonna del Ghisallo, shrine of Italian cycling. After paying our respects at the chapel – museum and taking in the fantastic view, we’ll transfer by van to our headquarters hotel, pack our bikes and enjoy a final farewell dinner. Day 12 – Morning airport shuttles. “15 Trips We Love” in the December 2008 issue.